Ottawa used to have a wonderful vegetarian Thai restaurant called Sacred Garden. Sacred Garden also happened to be about a 20 minute walk from my house, which made it both equal parts wonderful and dangerous. At Sacred Garden most dishes could be made vegan, and none contained the dreaded fish sauce that permeates Thai cuisine. They even stated right on the menu that they didn’t use it. Every trip to Sacred Garden guaranteed a fabulous mouth party. I usually stuck to the same entrees though: pad thai, panang curry, and pad ki mow. Their spring rolls brought me to tears, and induced fierce and uncontrollable cravings. One of many visits to Sacred Garden. I have many fond memories of Sacred Garden. I probably took just about every friend I have there at one time or another- omnivore or not. The little Thai lady who ran it knew me by name, and when I called in a take out order she always remembered, “no egg, no mushrooms” before I even had to say it. But I was out for a run in December of 2009, and when I ran past Sacred Garden I saw the sign that nobody wants to see on their favorite restaurant: CLOSED FOR BUSINESS. I was pretty depressed for at least a week. But the repercussions have lasted long beyond that. I try not to think about Sacred Garden too often, because when I do I become despondent. We had such a good thing here… to have lost it seems beyond comprehension. Sacred Garden’s closing left a huge void in the Ottawa vegan food scene that has yet to be filled, although thank goodness for some of the fantastic eateries that we do have. I love each and every veg restaurant in this city, but none of them do Thai like Sacred Garden. Consequently, I’ve set about trying to emulate the delicious flavours that once left my mouth roaring with delight. Unfortunately, this effort has been a dismal failure. However, there have been some good things. 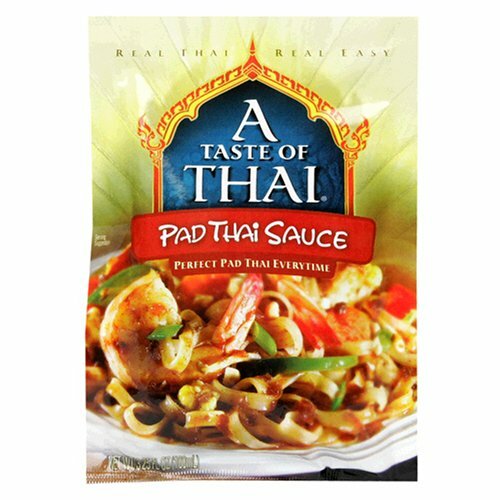 For one, I discovered Taste of Thai prepared pad thai sauce, and lo and behold… it’s vegan! Now, normally I prefer to make things from scratch, but I have tried, over and over, to make an adequate from-scratch pad thai and I have yet to make one that is as good as this one. It’s not perfect, it’s certainly not Sacred Garden calibre, but it gets the job done. I even made it for a co-worker and her husband, and she reported back that it was very similar to the “real” thing. Taste of Thai also makes a range of curry pastes and a spicy peanut sauce that I will blog about at a later date. They’re also not difficult to find: I’ve purchased them at Loblaws, Food Basics, and Metro. – In a frying pan, saute (just a bit) your choice of vegetables (lots of those). My stand-bys are red pepper, zucchini, and broccoli. I used julienned carrots and onions as well this time. – If you’re feeling protein deficient (ha!) toss in some tofu cubes, or some sort of mock meat. I personally love it with Nelakee faux shrimp and President’s Choice meatless chicken breast. – Add the noodles and the sauce packet. Toss to mix/warm. Serve. 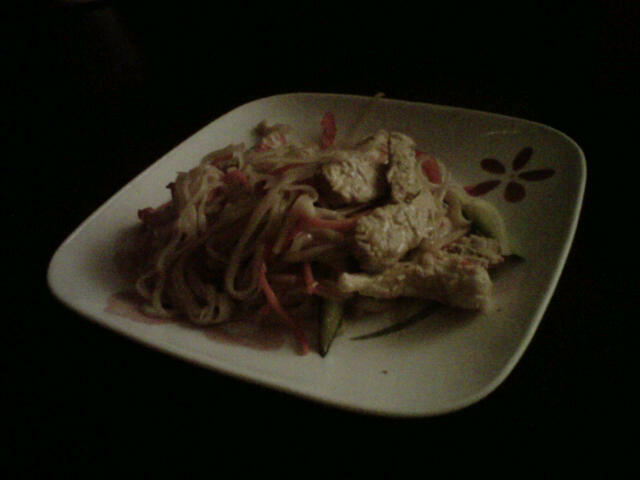 Homemade Pad Thai with faux chicken and shrimp. Previous PostMock meats of Ottawa’s Chinatown, Part 2Next PostPizza Pizza Pizza! I fondly remember that day we were at Sacred Garden 🙂 It was so there… now it’s so gone.